The wine reflects the rich, round, powerful style of Washington fruit, highlighting seven varietals. It is a true example of the art of blending. 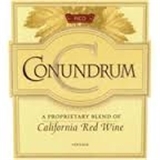 The wine offers jammy boysenberry flavors from the Syrah with a luscious backbone from the Merlot. The other varieties add the "spices" that all winemakers love to work with. This would be a great match with barbecue ribs.